Before I had only 1/4 of the image and moved! I’m still getting the black edges with or without high dpi settings checked. It’s look like gifcam is recording an extra pixel around the recording area edges (the black frame one pixel thickness surrounding the recording area), I don’t know why that happens? what Windows edition do you have (Home, Pro, Enterprise) maybe different editions have different measurements, or maybe that issue happens in specific screen resolution or settings, I will try to investigate on this. This worked perfectly for me! Thanks. Great :) thanks for the feedback Sam. IT WORKED!!! It was so frustrating not to be able to record what you want! Even increasing the size of the gifcam window didn’t capture the video unless you made it tiny. Thanks so much for the upgrade! Windows 8 64 bit, FHD screen. Hi, could you add a way to save in gifv format? gifv format is originally mp4 or webm, gifcam currently exporting to avi, The reason for choosing avi format is because avi format is part of windows system (avifil32.dll), it doesn’t require separated file or encoding library (making gifcam portable), you can use GiffingTool it uses FFmpeg.exe file for encoding WebM. But with this update you fixed the issue and now everything works fine again! Thank you so much for this great tool and this update! >I encounter the same problem with the previous version of gifcam. When i was using Windows 8 i was able to fix a similar issue (not just a couple of pixels) with “disable hight dpi display” but it doesn’t work this time. “Thank you for your work !” is that a true thank you or it is a thank you in a bad way! (I’m just joking). I think it’s a scaling Issue I will try to fix it, for now go to Control Panel\Appearance and Personalisation\Display then click on “set a custom scaling level” and check if your custom scaling level is 100%. http://imgur.com/SS4s95J – at 50% you can see there’s a pixel of black border, then a further few pixels of white or red on the top and the sides. No idea why that happens, the recording frame was well within the video boundaries. http://imgur.com/yPAsAX1 – this one was recorded at 25% and there’s just a one pixel border of black. Any help you can provide would be much appreciated, I use GIFcam all the time and have yet to find a program that’s as useful for GIFing live events. I’ve been using GifCam on Windows 7, but now I’ve switched to Linux (Ubunt 15.10), and there aren’t really any decent animated gif recorders out there! Is there any chance that GifCam will run on Linux? At the moment I have no plan for a Linux version, but you can run GifCam under Ubuntu + (installing Wine package). Hi when making a gif at 33 FPS the gif is sped up from what the video I was recording is. How can I fix that? 10 FPS makes the video too choppy. I’m still getting a border around the image in 5.1. It’s capturing 3 extra pixels on all sides (except the bottom only captures 1 extra pixel). Disabling High DPI in GIFcam’s properties does nothing. I have to disable Display Scaling for my entire computer to fix this, which is not an option. Running Windows 8.1, Surface Pro 2. 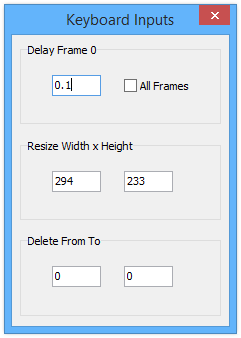 Back then I thought I solved that issue completely but Gifcam doesn’t scale well with High DPI screens, I wrote better code to deal with display scaling in VClip http://blog.bahraniapps.com/vclip/ I will bring that to gifcam in the next update. Thank you! I’m using GifCam to capture video for my indie game on Twitter, and GifCam had been recommended to me by lots of other game developers. Other than this one issue, its perfect. Thank you. Would it be possible in the next version to show the position of the upper left pixel after the size of the window? And also it is possible to add the possibility of moving the GifCam window with the four arrows of the keyboard. It would be useful to resume a capture after several days. Is there any reason why this error happens? I get the first 2 errors when resizing a gif to 60% or so, and the last one when it crashes when i try to close gifcam. Hi, I think I just encountered some problem. I was using GifCam 5.1 over Blender 2.78c to film some showcase for what I’m working on and sometimes after adjusting the GifCam’s window frame, the title bar of the GifCam became click-through. Making it impossible to move the frame. I’m not sure what’s the cause of the issue. and when I use gifcam 5.1, it records not only the screen, but also the box itself. Can u fix this problem?? This is a pretty neat looking tool. I like the idea of it being a “lens” through which you look at…like a ship portal or a window. However, I just download v. 5.1 and am having trouble getting it work correctly. The Edit button is never enabled for me. Now I can’t even open it successfully after having customized the dimensions preference.